Walking with Jesus: Day 190: John 18:1-11 & Psalm 69 - Why Did Peter Strike with His Sword? Day 190: John 18:1-11 & Psalm 69 - Why Did Peter Strike with His Sword? 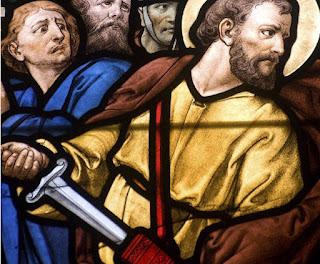 Why Did Peter Strike with His Sword? In today's passage, we see Peter do something incredibly rash and foolish, even for impetuous Peter: He draws his sword and strikes Malchus, the High Priest's servant, cutting off his ear. The other Gospels tell us about this sword strike, but they don't name the assailant. John alone tells us both the name of the offending disciple (though we probably could've guessed that it was Peter) and the name of the afflicted servant, Malchus. John also is the only Gospel-writer to tell us what happens right before Peter swung his sword. When the crowd of temple guards and officials comes in the middle of the night to arrest Him, Jesus, knowing all that would happen to him, came forward and said to them, “Whom do you seek?” They answered him, “Jesus of Nazareth.” Jesus said to them, “I am.” (John 18:4-5) Now the ESV and most other English translations add "He" after "I am," but John simply tells us that Jesus said, "I am." This "I am" statement is really the culmination of the "I am" statements of Jesus throughout the Gospel of John, a final and clear assertion of His identity as the great I AM, the LORD God Almighty, right before He is unjustly arrested. But Jesus does more than just say "I am." He clearly did so with great power and authority, for "When Jesus said to them, “I am he,” they drew back and fell to the ground." (v. 6) So, here we see Jesus identifying Himself as "I am" and the whole crowd of armed guards falls to the ground. To me, this makes Peter's actions even more strange and seemingly pointless. Why draw your sword to defend someone who had just knocked a whole crowd of people to the ground with two words? Remember that earlier in the evening, Jesus had told Peter that he would deny Him three times. Peter had objected to this prediction and pledged to stay by Jesus' side, even if it meant dying with Him. Here Peter is both showing his earnestness and trying to help Jesus out of a tough jam. He's going to lend a hand, and a sword, to Jesus' cause, to help Him be victorious. When will we ever learn the lesson of Peter's foolish sword-swinging and stop trying to either prove ourselves to Jesus or else lend Him a hand to help Him out? Abraham and Sarah thought they would lend God a hand and have Abraham sleep with Hagar, Sarah's handmaid. As a result, Ishmael was born and serious conflict was introduced to Abraham's house and the world. God know what He's doing. Jesus has already validated and fulfilled every promise of God. The plans and purposes of God will stand fast. We don't need to worry and we cetainly don't need to try to help God out. We do need to trust Him and follow Him, letting Him do what He wills and accepting His ways as better than ours. Once we do that, and put our swords away, we will begin to find His peace.